About a month ago, we had an earthquake here in St. Louis at 4:45 in the morning. Not a bad one- 4.8 I think- but it was enough to wake me. I used to live in San Francisco, so I immediately recognized the feeling. I went down to the studio to check things out. Fortunately there was no damage. 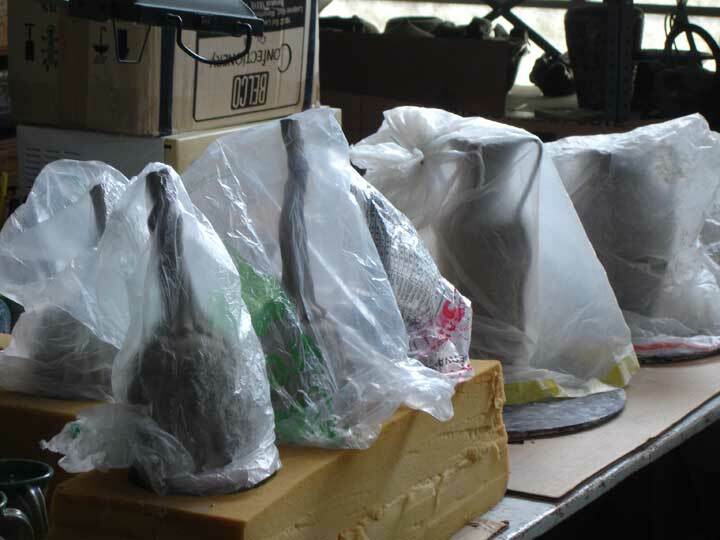 But as an immediate reaction, I put a lot of pots on the floor and removed a number of pots that were close to an edge where a small after-shake might cause them to fall. 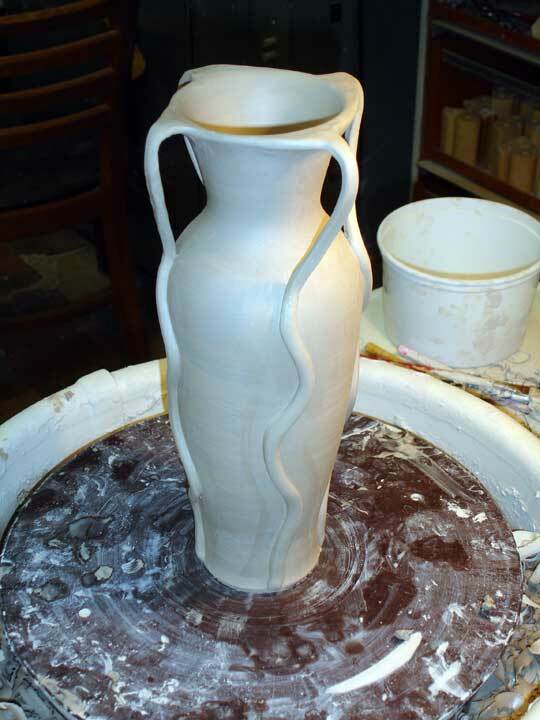 Now you can imagine what a signifigant earthquake could mean to a potter- or a pot collector. I decided that I would take a week or so and earthquake proof the studio as best I could. I have a lot of 11' tall shelving- some of which is only 18" deep. It would not take a lot to tip them over in a big shake. So all the shelving got bungee cords on each shelf and braces that would hold them to the wall. I extended the top shelving corners as well so I could bungee the very top shelf as well. 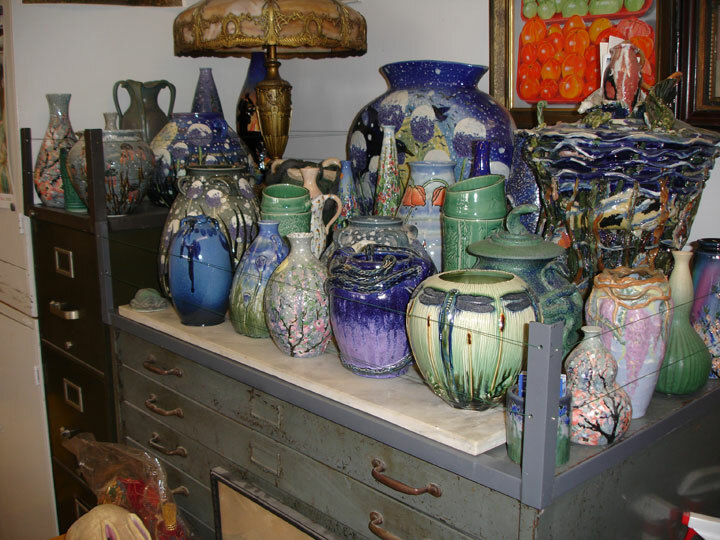 I also secured cabinets, neon signs, sculptures- anything that I thought might fall if shaken. In other parts of the house, I found elegant solutions to restrict the motion of shelved objects. This was a minimal solution. I cut a 1/8" rod to length and gave it slight bend to have it bridge a modular bookcase side to side. 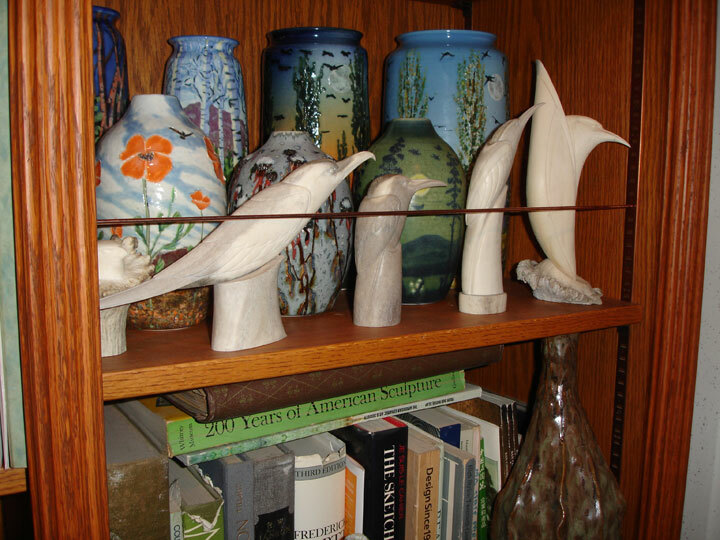 By the way, those are antler carvings from a woman up in the Yukon by the name of Maureen Morris. For the tops of large flat surfaces, I had to make up some "fencing" that would stop pots from being shaken off the top of file cabinets and the like. I was going to use that 1/8" rod here as well, but then I thought it would be a lot of trouble and I really wanted the fencing to be as invisible as possible. So I ended up using some really fine, yet strong, wire. In addition to the earthquake-proofing, I had to visit areas of the studio I had not seen for five years. Better believe spots were dirty and dusty. Naturally, all this commotion lead to a lot of cleaning in the more obscure spots of the studio. 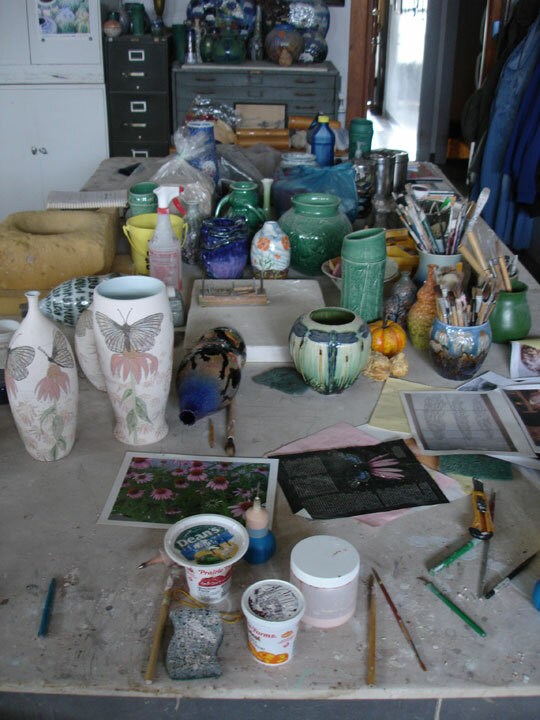 I had a lot of displaced pots temporaily sitting about the studio. This is my main work table. Before the earthquake and after, I was working on four VERY elaborate pieces. 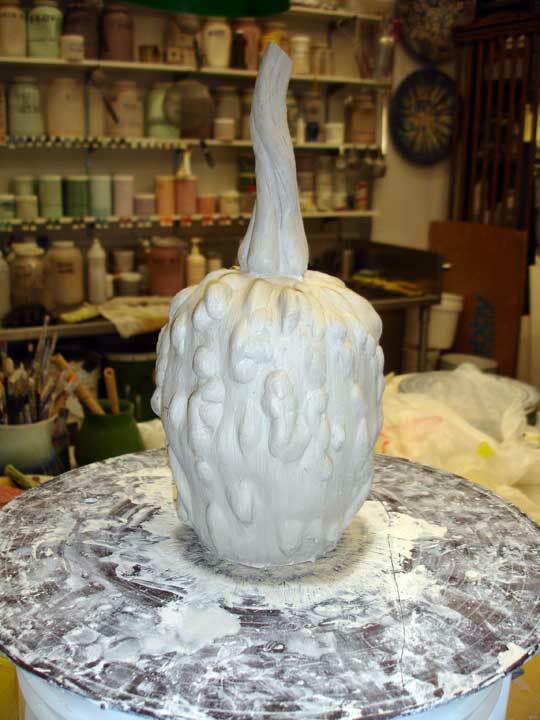 I was using a new glazing technique that was very involved- dare I say -convoluted. Those are the pots in the bottom left of the picture. I did take some time to do a pot update and sell a few pots. I needed the $. 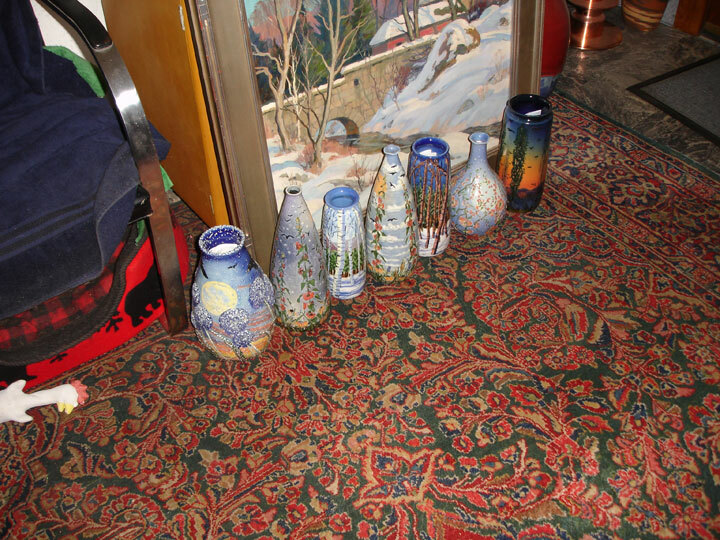 I sold a few pieces I would have liked to keep, but I let a few go anyway. These are those four really elaborate pieces. Here is what the glazing looks like up close. It was a new process and very involved. 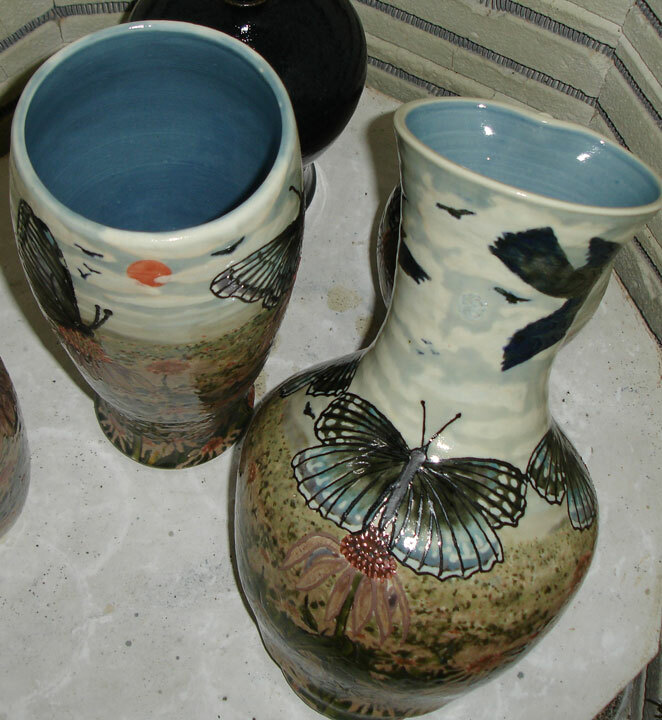 So I glaze these four pieces for a month and put them in the kiln. And the results were disaster. This is a picture I took when the kiln was still at 800 degrees. 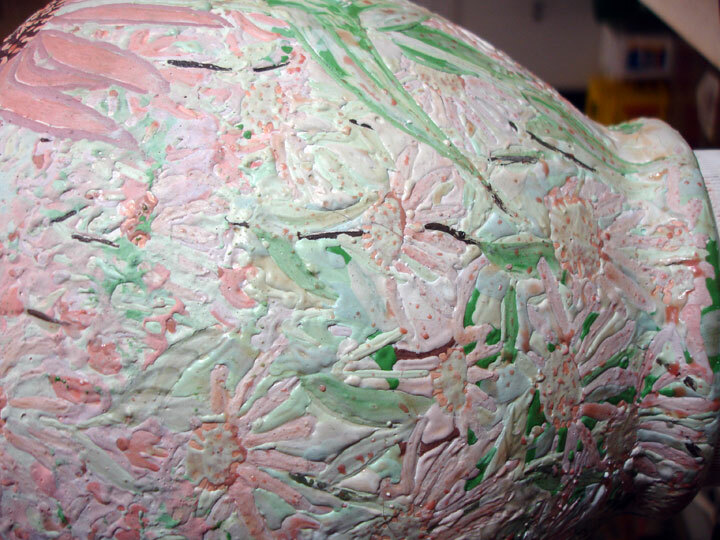 The biggest piece had a paper thin area right near the bottom of the pot and when the temperature rose to where the glaze would melt, the clay melted as well and it slumped over on another pot. Normally, I would have noticed the thin spot as I was glazing, but because of the new glazing process, it escaped my attention. Two are lost since everything fused together and they were fused to the shelf as well. Ok, that is not too bad. I still have two finished pots, right? Ya, they were "finished" all right, but were they ugly. I don't know what happened. The colors were washed out. It was like I didn't know what I was doing. The pots are so disappointing, I won't show them to you. It is embarrassing. 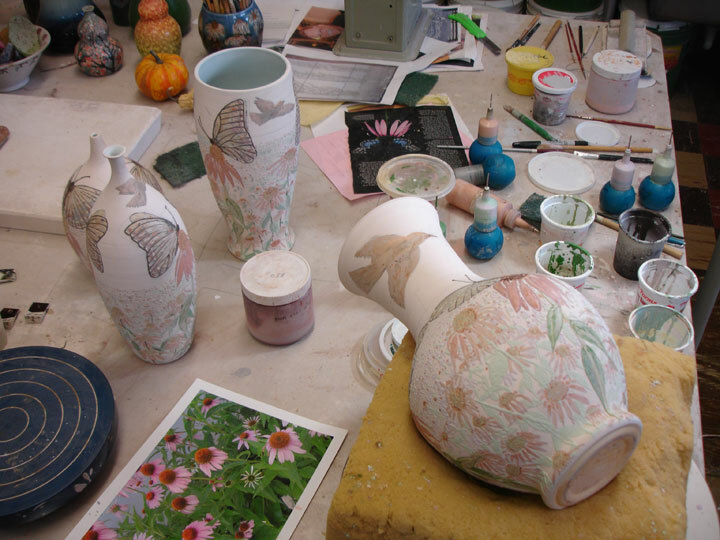 And I don't think they can be glazed again because they are so elaborate and I don't want to spend any more time on them. I just dropped glazing and started making some fun and simple pots. Since I have had a number of people inquiring about small gourds, I thought I would make a few. 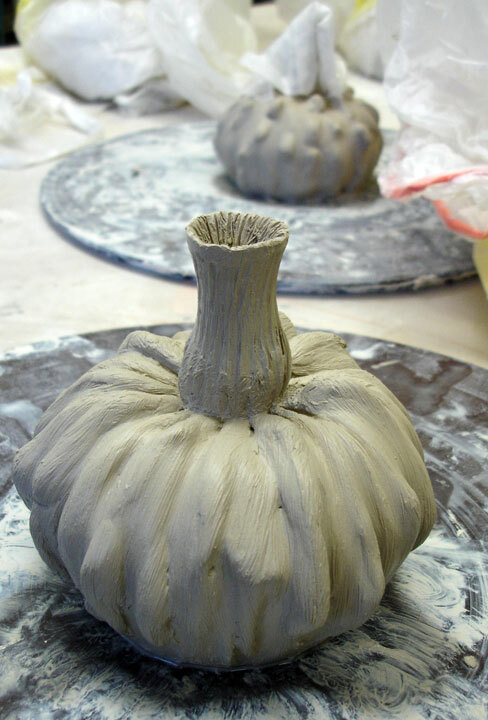 These are fun to make and fun to glaze. And damnit, after that last failure I want to have some fun! 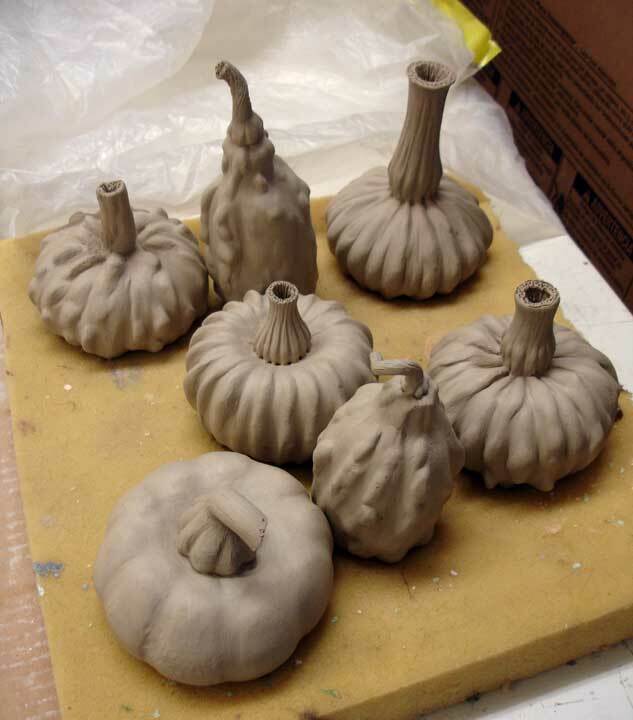 Thanks to Tim Miller who actually sent me a small box of gourds for inspiration! Well, I figured why not make a few big ones? 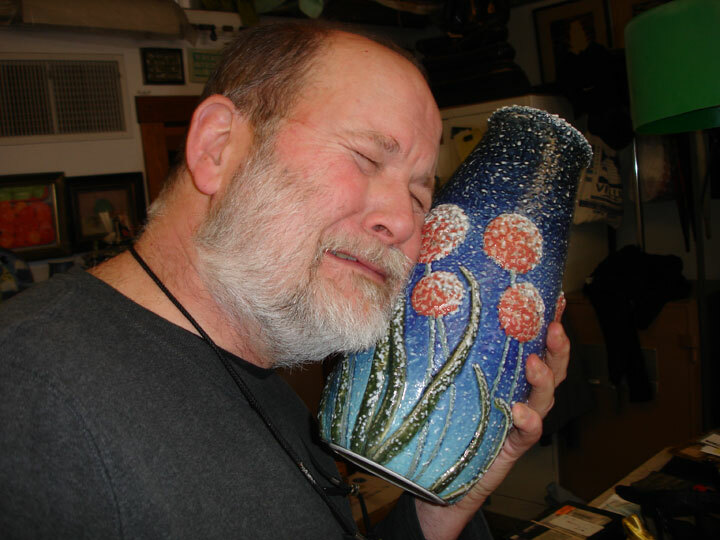 Here is a pot and glaze that I would like to reproduce. I can never get close to pots that I made in the past, particularly when I have glazed and fired them numerous times like this one. 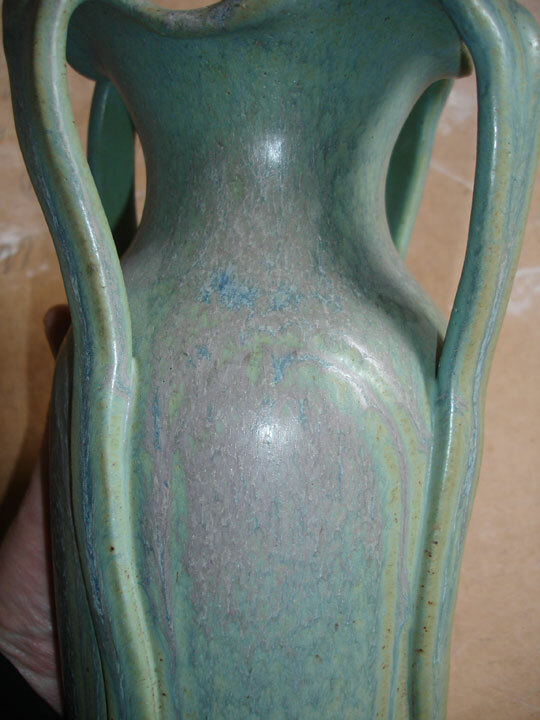 I would call this "opal" glaze, and I am going to try to reproduce it. I made a few pots with handles. This one has handles that look particularly fragile. I tend to let everything dry slowly and I have all these "ghosts" sitting about the studio. 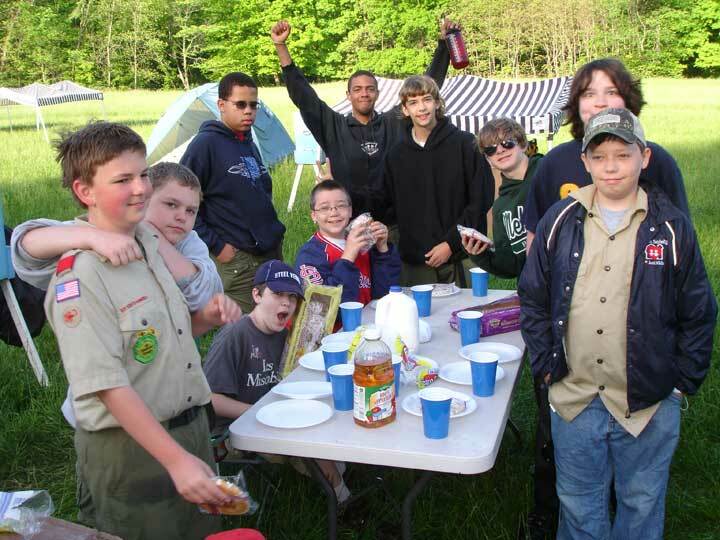 I did do a little scouting two weekends ago and I am gearing up for summer camp for a week in early July. I have an number of eccentric ideas for things to do with the kids at camp this year. I would urge anyone with young kids to attend a scout meeting at a few nearly troops and see if the kids are interested. It is a great thing- both for the children and adults! From this photo it is pretty obvious the boys are having a good time.